I’ve been creating, but overdue on posting – the good news is that I loved the results of my Pinterest inspired project this week! I created a giant crossword that all attendees could contribute to throughout the afternoon. I was inspired by this Pin from my Parties & Events Pinterest board – which happened to have been created and posted by my friend Sarah (though I didn’t know it at the time – crazy! )… I’m sure I repined it from her originally, but I didn’t know she was the originator at the time. 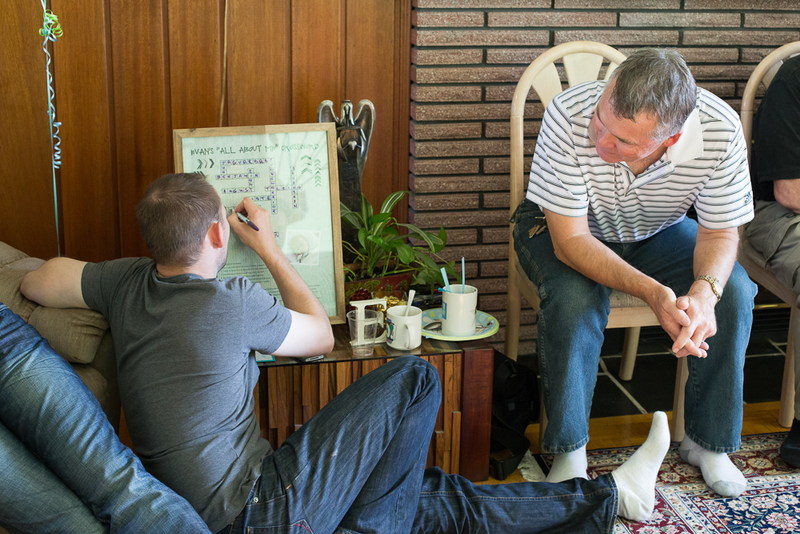 All the questions were facts about Evan and highlights of his first months of life. I called it: ‘Evan’s “All About Me” Crossword’. After coming up with the questions and answers, I plotted them into a crossword within Excel. Questions ranged from Evan’s nickname, to how many weeks early he arrived, to the name his 2.5 year old brother insisted we name him – “Jaguar Baby” (he has an extreme fascination and love of Jaguars right now…so cute), and many more – 14 questions in all. It turned out that creating the base of the crossword in Excel was perfect as I was able to create the crossword boxes in perfect form. I saved the final version as a PDF, and opened the PDF within Photoshop. From there I made it pretty by layering in a few backgrounds and playing with the opacity. I used a fun font, and added a photo and chevrons that I was really digging – especially since they emphasized my categories of ‘down’ & ‘across’ – adding a perfect visual. I created it to fill the largest frame I had (14″x18″), and simply printed it at home on 8.5″x11″ paper. It came out in 4 pages, which I carefully trimmed and taped together on the backside of the pages, so the tape wouldn’t be seen. 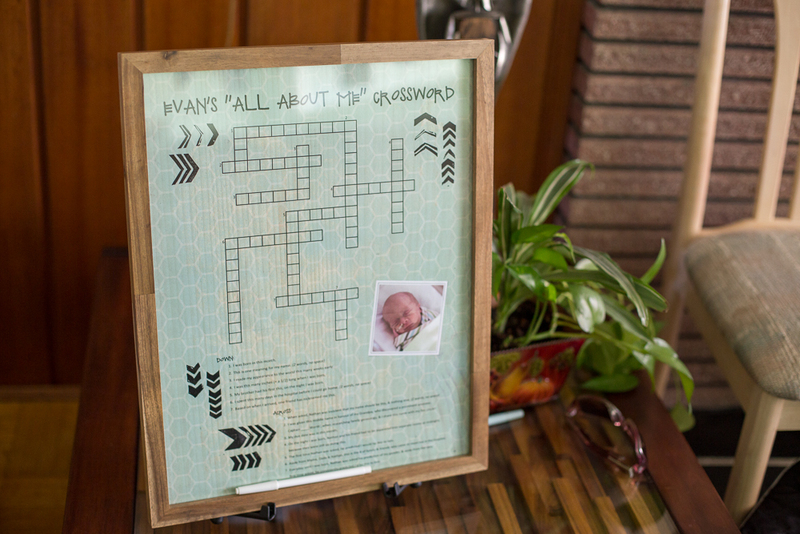 I then placed it into the frame so that the crossword answers could be written onto the glass with a wet erase marker. Before printing at home, I considered paying to have Staples print it on one larger piece of paper to avoid any seams, but they quoted $14 to do this, so I decided to try it myself first. As hoped, once assembled, the seams were barely noticeable and virtually disappeared once I put the crossword behind the glass of the frame (yay!). I even had one friend ask how I printed it so large. 😉 The frame then rested on an inexpensive table top easel that I picked up from Staples. 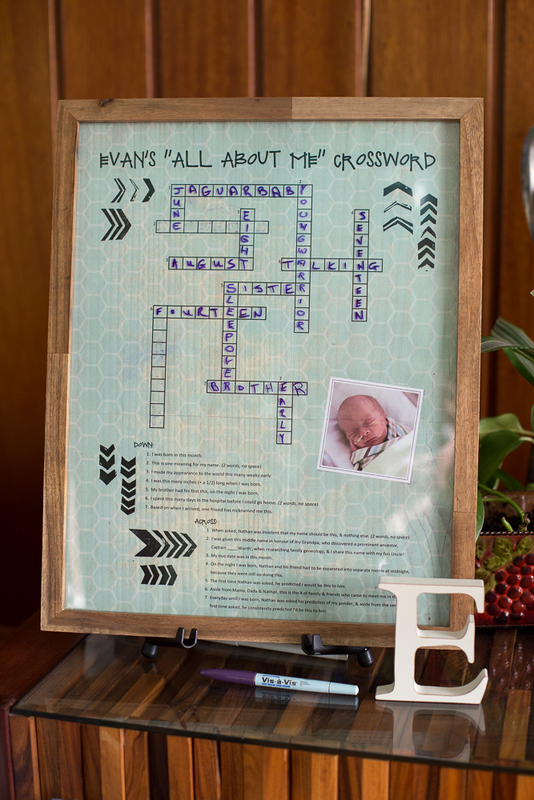 It was a hit and a fun addition to the party, allowing guests to get to know our sweet baby boy. Whenever I get around to creating the baby book that I’ve started designing *in my head*, I plan to include a smaller version of this crossword on one of the pages. …sigh, if only I had enough time to create all the *in my head* designs and projects. I pinned this quote to my Quotable Quotes board not too long ago and WOW, is it ever the reality I need to remind myself. What quotes are ringing true for you lately? What project would you create if time were no limitation? Great job, Jo! Very neat idea for a party!